Two armed robbers struck in broad daylight at a jewellery shop at the Focal Point Urban Estate Phase II and decamped with gold and cash worth over Rs 13 lakh here today. 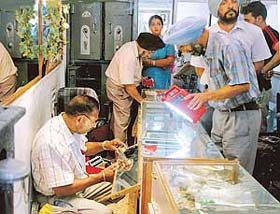 Fingerprint experts look for clues at a jewellery shop in Ludhiana where armed robbers struck on Saturday. The increasing number of auto-rickshaws in the city that was till now ruffling the feathers of commuters and environmentalists only has now also been opposed by union of three-wheeler drivers. The Sarabha Nagar firing case allegedly involving four girls has taken an interesting turn with the girls claiming to be innocent and falsely implicated at the behest of a son of a local leader. 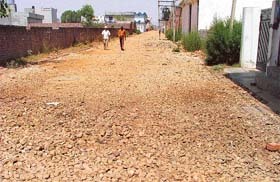 Residents of Aman Nagar and Akash Nagar have a bumpy ride to their destinations everyday as the 30-feet-wide approach road lies incomplete as the Local Bodies Department has withheld the file regarding the work. With elections just over six months away, the BJP seems to be in full gear. Particularly after senior leader, Mr Arun Jaitley took over as in charge of the party affairs in Punjab with Mr RP Singh as his deputy. Both have a thorough Punjabi background. The All- India Shiromani Akali Dal today regretted the division among the Panthic ranks and called for unity to "oust Mr Parkash Singh Badal from various Sikh organisations like the SGPC". It asked the Panthic leaders to shed their personal egos for this. The Indian National Trade Union Congress has urged the government to give due representation in the government committees such as the District Grievances Redressal Committees, Sales Tax Advisory Committee, Telephone Advisory Committee, Wages Committee, Employees State Insurance Committee (Vigilance ), Employees Provident Fund Regional Committee, etc, so that the interest of the workers, labourers and government employees are duly protected. 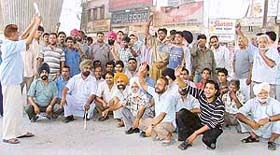 A complete bandh was observed in the town yesterday in protest against the publication of a joke in a school magazine that allegedly hurt the sentiments of a community. The Ludhiana Vigilance Bureau today arrested a Junior Engineer with the Punjab State Electricity Board on charges of taking bribe for installing a meter in Kundan Puri. The long-pending demand of entrepreneurs of Punjab has come true after the release of Rs 50 crore by the government for the disbursement of industrial subsidy sanctioned as per the industrial policy. Small and tiny units in electroplating, bicycle parts and sewing machine industry have demanded that abetment of 70 per cent be granted to them in case of service tax. Mr Bal Krishan Bansal, manager of the local branch of the Oriental Bank of Commerce, told media persons that to facilitate its customers, the bank has decided to extend working hours from 8 am to 8 pm. Students from private schools affiliated to Punjab School Education Board have once again brought laurels to the city by securing positions in the merit list of the matriculation examination, released by the board yesterday. Samanpreet Kaur of the local Chopra Public Senior Secondary School has bagged the first position in the district and sixth in the state by securing 595 marks out of 650 in the Class X exam. From left: Samanpreet Kaur, Yogesh Jain, Manmeet Kaur, Navdeep Kaur. Maintaining its tradition, students B.Com-III of Government College for Women have brought laurels to the institution by bagging top positions in the district. Ms Arti Sharma topped with 83.28 per cent marks. Mr Narinderjit Singh, Secretary, Higher Education has assured the Principals of Government Colleges of the state that the department would provide all necessary help for the smooth running of the colleges. A 10-day summer camp at BCM School, Pakhowal Road concluded here today. Students from different classes participated enthusiastically in dance, bhangra, shabd gyan, computers, pot painting, art and craft and sports activities. 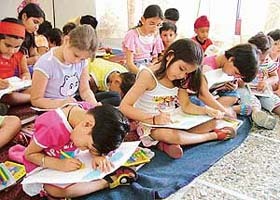 Contestants take part in a drawing competition at Whiz Kid Playway in Ludhiana on Saturday. A three-day masters trainers programme for government school teachers concluded at Government Inservice Training Centre here yesterday. The programme was organised under the directions of Director General (School Education) Seema Jain IAS and SCERT Director Harcharanjit Kaur Brar. State government employees are fed up with anti-employee policies of the government and have been forced to protest to press for their demands, said Mr Balbir Singh Ghuman, district chief of the Government Teachers Union, here today. The Judicial Magistrate has sentenced Iqbal Singh of Rishi Nagar, Haibowal Kalan, to six months imprisonment. The accused was booked in 2003 under Section 379 of the IPC at Haibowal police station on the written complaint of Mr Kulwant Singh, SDO, PSEB. The Ludhiana Sanskritik Samagam will stage Navin Kumar and Prairna Aggarwal’s ‘Sharaarat’, a family comedy at Guru Nanak Bhawan, here, on June 14. The play features Shweta Tiwari of ‘Kasauti Zindagi Ki’ fame and Vinay Jain in the lead roles.